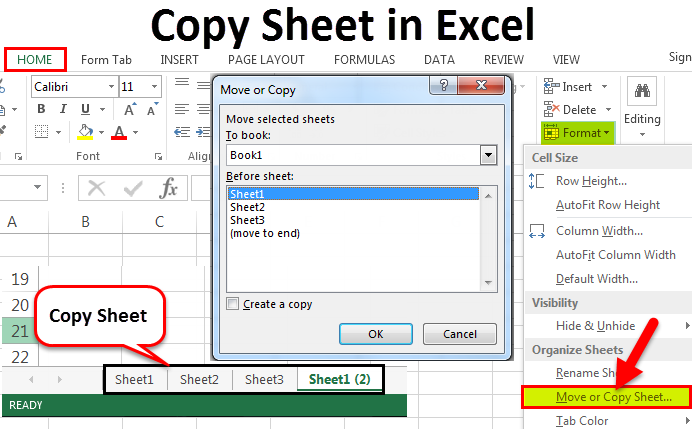 Home » Excel » Excel Tips » How to Copy Sheet in Excel? 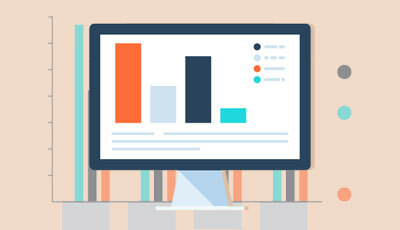 How to Move or Copy Excel Sheet from Another Workbook? How to Move or Copy Multiple Sheets in Excel? 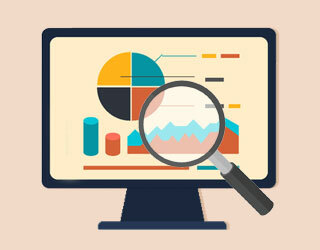 The worksheet of Excel is a workspace that contains a series of cells containing your data. 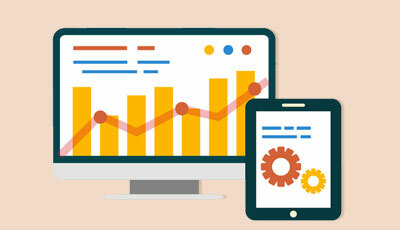 In Excel many times or in many situations we need to create a new spreadsheet based on an existing sheet or move a tab from one excel file to another. Sometimes we need to take a backup of a worksheet which is useful and important for future purposes. 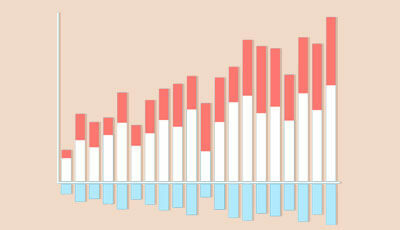 There are various easy and quick ways to create duplicate sheets in Excel. How to Copy a Sheet in Excel? 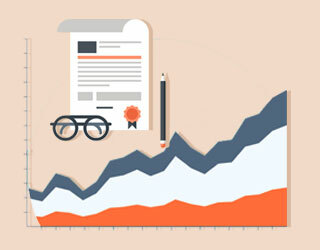 Excel provides three ways for creating a duplicate worksheet in excel. They are Mouse, Keyboard and Excel Ribbon. 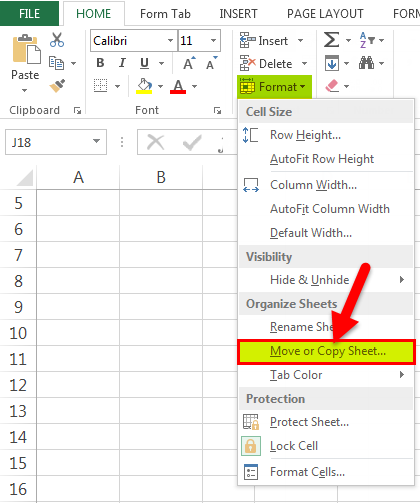 Below are the 3 ways for creating a duplicate Sheet in Excel. 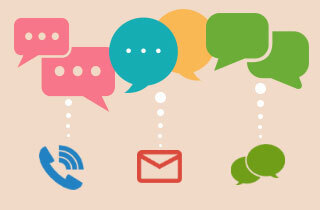 As per our understanding drag & drop means to move something from one place to another. This method is the very easy and fastest way of copying the sheet. Click on the sheet tab (Sheet1) that you want to copy. Refer below screenshot. Press CTRL key and drag the Sheet1 where you want to place it then, this will create a copy of the Sheet1 with the name of Sheet1 (2) as per below screenshot. Right click on the sheet tab. It will open a drop-down list of options. Click on Move or Copy option from the drop-down list. This will again open the Move or Copy dialog box. Refer below screenshot. 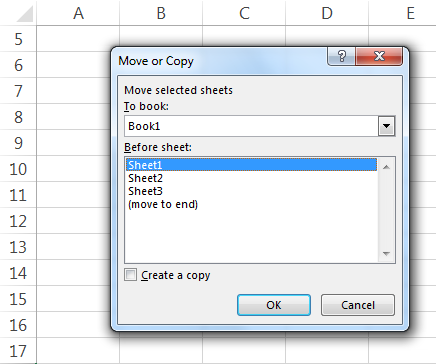 Select the option under Before Sheet section, where you want to move or copy the sheet (Sheet1). Here I want to copy the sheet at the end of the sheets hence selected the last option which is a move to end. Tick on the box “Create a copy”. Click on OK. It will create a copy of Sheet1 like below screenshot. Go to the HOME tab. Click on FORMAT option under Cells section shown as below screenshot (denoted by a red box). This will open a drop-down list of options. 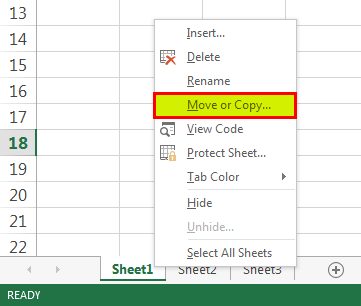 Click on Move or Copy Sheet option as shown in below screenshot. This will again open a Move or Copy dialog box as shown below. 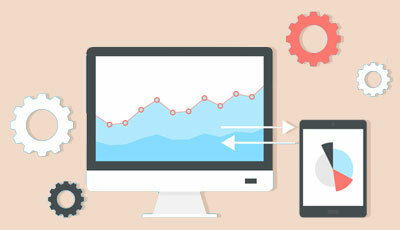 Follow the same steps which we followed under Copy sheet by Right – click section. 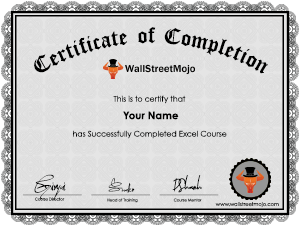 If we have done some work on Excel workbook and have to share some part of it or one sheet with someone. We don’t want to share the whole workbook with him due to some critical and confidential information. 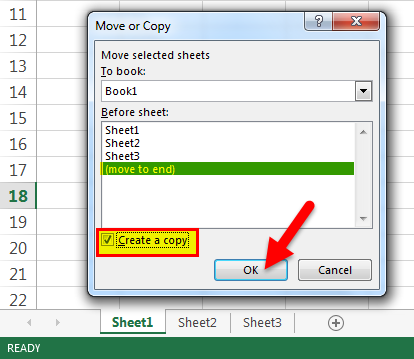 In that case, we can use this option of copying the sheet from our workbook into separate excel workbook. Steps are the same which we learned in the above section. 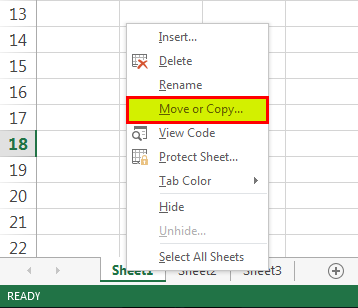 Right click on the sheet tab which you want to copy and then choose the option Move or Copy from the drop-down list. Again Move or Cop dialog box will appear as shown in below screenshot. Click on “To Book” and select the target file. 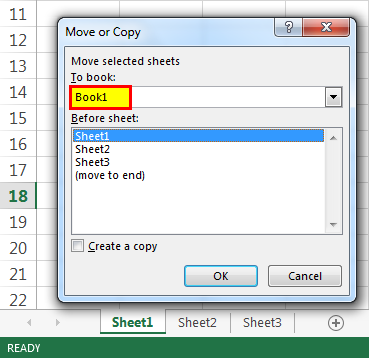 To copy the sheet into a new workbook, select a new book then, Under Before sheet section, choose the destination where you want to place the copy of the sheet. Also, tick on Create a copy checkbox then, Click on OK.
For selecting adjacent sheets, click on the first sheet tab, press SHIFT key and click on the last sheet tab. For alternate or non-adjacent sheets, click on the first sheet tab, press CTRL key and click the other sheets tab one by one which you want to copy. 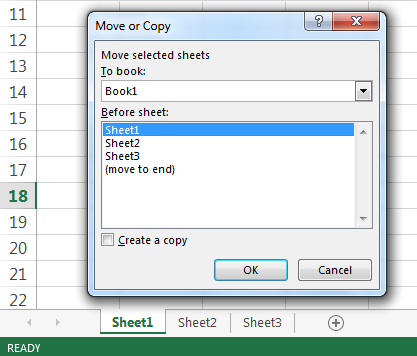 After selecting multiple sheets, do a right click. Drop down list will open. Choose Move or Copy option. 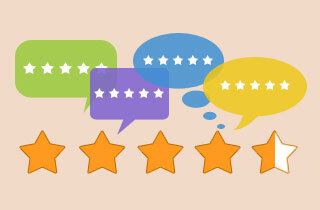 Follow the same steps as we discussed in the above section. 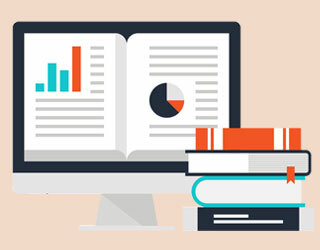 When we open Move or Copy dialog box, under “To book” section, Excel displays only the open workbooks in the drop-down list. Hence open the destination workbook before copying the sheet. How to Hide a Column in Excel?